Very sweet little earrings!! Love them. These earrings are so pretty! 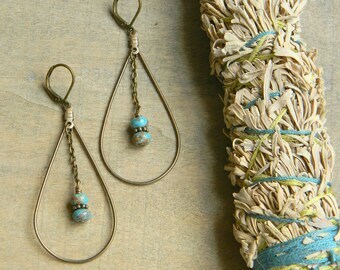 I love the design in the copper and the African turquoise beads are a perfect complement. Lightweight and a pleasure to wear. Great service from this shop. Hoops galore~from teeny tiny to big and bold plus turquoise tear drops! I thought I'd try a shimmery red version of my popular Turquoise Southwest Dangles. I think I may have a new favorite. Thanks for taking a moment to find out a little more about me and Songbird Cabin Designs. I live in beautiful North Carolina in a little log home tucked into the woods. The name of my shop was inspired by where I live. I am so blessed to be able to look out my windows and find endless inspiration in the light through the trees, the full moon over mighty oaks, the abundant flowers of spring and summer, the breathtaking colors of the autumn leaves, the birds and the bugs and the tiniest of acorns adorning the path through the woods. I started making jewelry as a way to exercise the creative side of my mind. In the jewelry I make, I try to express my appreciation for the beauty of my surroundings and the simple loveliness of nature. I truly enjoy every aspect of my shop~from the seeking out of special beads and findings, to creating pieces, photographing them and even packaging them up to ship off. Even after several years, I am still thrilled every time someone purchases one of my designs. The idea that someone wants to wear something I made with my own hands is so rewarding. My plans for the very near future include learning the art of metalsmithing. I have been researching this and am slowly starting to dip my toes in the water. So stay tuned. . . Thank you for shopping at Songbird Cabin Designs. I enjoy being out in nature and so many of my designs are inspired by my appreciation for the beauty and wonder of the natural world. If for some reason, you wish to return the item you can do so within 7 days of receipt. You must pay for the shipping back. A full refund of the original price will be credited to you as long as the item is returned in good condition. The orginal shipping will not be refunded. I accept payment via Paypal and Direct Checkout. Your order will be shipped via USPS. For ready to ship items, I will ship your item within 2 business days following payment-barring unforseen circumstances. For made to order items, please see item description for current production time frame (usually about 1 week). For international shipping, please note that customs fees/duty taxes/VAT (Value Added Tax) are the buyer's responsibility. Please convo me with any shipping concerns.